A board-certified physician assistant, Richard graduated from the University of Florida with a degree in nutrition and dietetics. He continued his education at Nova Southeastern University, where he received his physician assistant degree. During this time, Richard decided to specialize in dermatology because he realized that he could make an immediate difference in peoples’ lives. Richard practiced dermatology for three years, and when an opportunity to join Water’s Edge Dermatology became available in 2006, he was thrilled. He knew about Dr. Schiff and the reputation of the practice and wanted to become part of it. 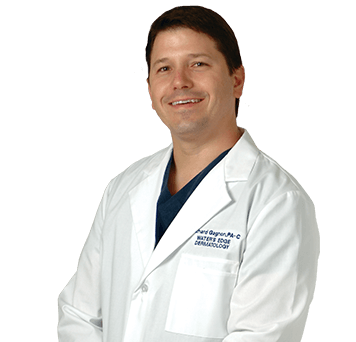 Richard likes the high caliber of patient care that Dr. Schiff demands and he appreciates Dr. Schiff’s advocacy of a strong physician assistant-physician team approach to delivering care. Richard particularly appreciates Dr. Schiff’s practice of requiring all staff at Water’s Edge to participate in continued education. For him this means training in new procedures and the opportunity to attend conferences to learn the most recent advances in skin care. Richard, his wife, and their two children reside in Palm Beach Gardens.